The Clybourn Avenue protected bike lanes. 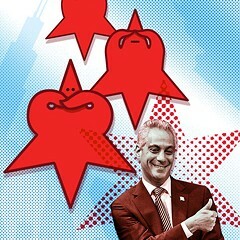 With multiple police abuse scandals and an impending potential teachers' strike, this has turned out to be a kidney stone of a year for Mayor Emanuel. But the silver lining of Rahm's reign has always been smart transportation policies, and our city racked up a remarkable number of wins in that department in 2015. Let's take a look back at some of the key local walking, biking, transit, and public space stories of the past 12 months, in roughly chronological order. In February, the CTA opened the futuristic, totally tubular Cermak-McCormick Place station, filling in a gap of about 2.5 miles between the Green Line's Roosevelt and 35th-Bronzeville-IIT stops, which has existed since 1977. Highlights of the new $50 million facility include a steel-and-glass canopy that provides plenty of natural light and weather protection, three entrances, and full wheelchair accessibility. 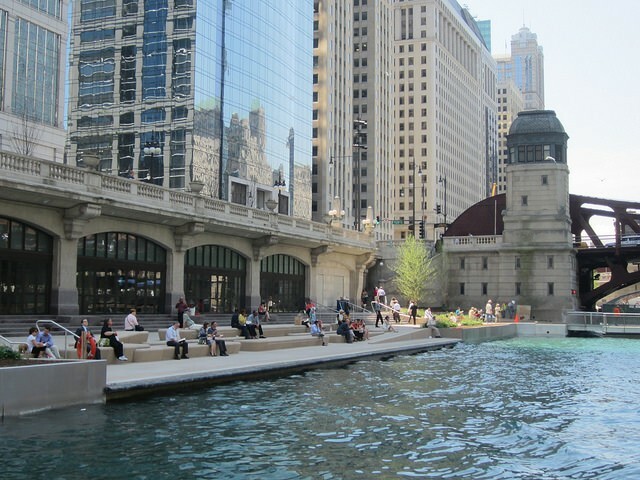 In May, Emanuel cut the ribbon on the $100 million Chicago Riverwalk extension, one of several marquee public space projects launched over the last four years. Areas dubbed "the Marina," "the Cove," and "the River Theater" opened, featuring sleek design and bustling drinking and dining venues, and new boat and bike rental franchises. Workers are currently constructing the next few sections, and the project will eventually create a car-free walking and biking route all the way from Lake Street and Wacker to Lake Michigan. But the highest-profile public space opening this year was the long-awaited Bloomingdale Trail, re-christened the 606, which debuted on—wait for it—6/06. The $95 million trail has proved wildly popular, attracting an economically and ethnically diverse crowd of strollers, joggers, cyclists, and skaters. Hopefully the user demographic will stay diverse, but developers are now rushing to build fancy housing on nearby land parcels. On the same day the 606 opened, a new section of the Cal-Sag Trail, a 26-mile path planned along the Calumet River, opened in the south suburbs. 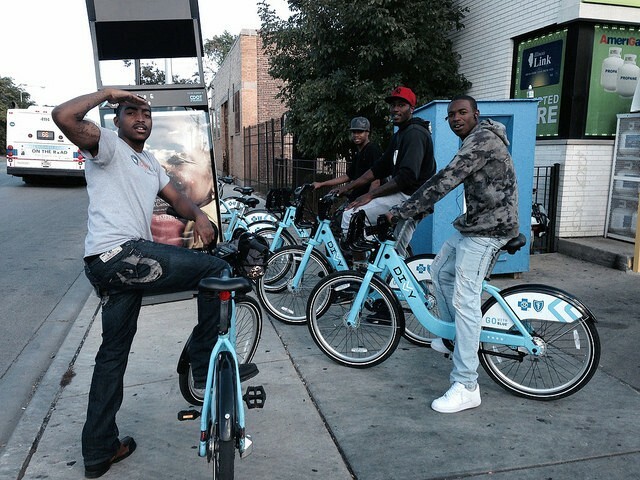 Friends check out Divvy bikes in East Garfield Park on one of three days in September when day passes were free. This spring, the Chicago Department of Transportation expanded the Divvy bike-share system from 300 stations and 3,000 bicycles to 476 stations and 4,760 bikes. The coverage zone grew from 19 percent of the city's geographic area to more than 38 percent, making our network the largest in North America based on number of stations and coverage area, although New York and Montreal's systems still have more bikes. Next spring, Divvy is scheduled to add 70 more stations, expanding coverage to new areas on the west side, plus Oak Park and Evanston. In July the city rolled out the Divvy for Everyone equity program, with the goal of addressing the system's lopsided membership demographics. Surveys found that, as with most bike-share systems around the country, Divvy members have been largely white, male, young, affluent, and well educated. The D4E initiative offers one-time $5 annual memberships to low-income Chicagoans, and waives the usual credit card requirement. As of early December, more than 1,100 residents had signed up. One positive aspect of the otherwise disastrous Bruce Rauner administration is that the governor has withdrawn support for the Illiana Tollway, a pet project of his predecessor Pat Quinn. This highway boondoggle, slated for an area just south of the metro region, would have destroyed farmland and induced sprawl, as well as putting taxpayers on the hook for $500 million in borrowing. In early June, the governor ordered the Illinois Department of Transportation to freeze all contracts and procurements for the tollway and remove it from IDOT's multiyear transportation plan. In late July, the agency that runs the South Shore Line commuter rail route between Chicago and South Bend, Indiana, finally agreed to test a bikes-on-board program after dragging its feet on the issue for years. Their decision was influenced by the Active Transportation Alliance sarcastically awarding them a Broken Spoke Award as the only commuter rail system in the country that doesn't allow bikes. The pilot begins next spring. 'The Cove' section of the Chicago Riverwalk extension. In September, the City Council voted to beef up Chicago's transit-oriented development ordinance, making it much easier to build dense, parking-light housing near rapid-transit stops. The new policy will make it easier for more residents to live car-free, and it's contributing to the city's current apartment-building boom, especially along the Blue Line. But not everyone is a fan. 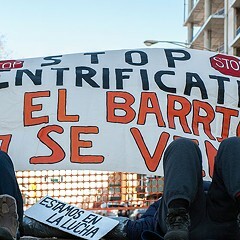 Virtually all of the new TOD projects are high-end, and groups like Somos/We Are Logan Square have argued that the developments will contribute to the displacement of low-income and working-class residents. While the city celebrated the achievement of Emanuel's goal of installing 100 miles of protected bike lanes on October 10, it didn't actually reach that milestone. The mayor's 2011 transition plan, which established that target, defined protected lanes as being separated by traffic by a physical barrier, such as a line of parked cars. However, after it became clear that wasn't a realistic goal, partly due to IDOT's politically motivated ban on protected lanes on state routes, CDOT watered down the definition to include buffered bike lanes. 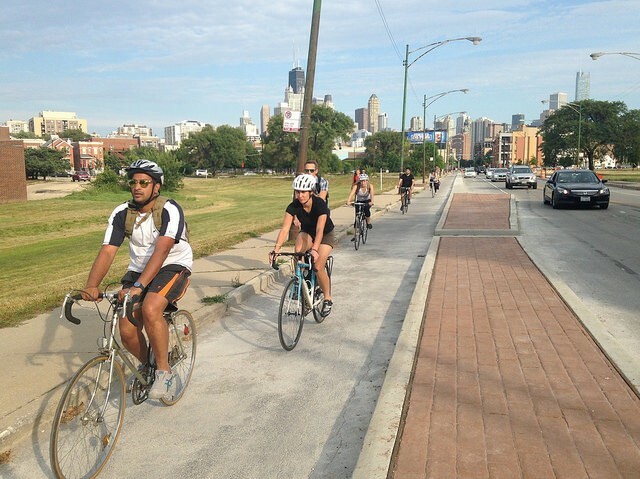 As a result, Chicago has actually installed only 19.5 miles of real protected lanes, during the past four years, plus 83.5 miles of buffered lanes. But that's still a major achievement. A #X9 Ashland Express bus. Moreover, some of the protected lanes that have come in recently have been very high-quality. This year, the city got its first bike lanes protected by concrete curbs on Sacramento, Milwaukee, Clybourn, and 31st Street. The Clybourn curb-protected lanes, which run from Division to North, are especially notable because they're the first protected lanes IDOT allowed on a state road, installed in the wake of the 2013 DUI crash on Clybourn that killed cyclist Bobby Cann. In November, the local transit agencies launched the Ventra smartphone app, which can be used to buy tickets and passes for the CTA, Pace, and Metra. In the wake of the glitch-filled Ventra card rollout, the agencies were careful to thoroughly vet the app before releasing it to the public, and its debut has gone relatively smoothly. The best thing about the app is that you can now pay your Metra fare onboard without being penalized with a surcharge. This was also a banner year for bus riders. After years of advocacy for restored service on Lincoln Avenue and 31st Street, spearheaded by 47th Ward alderman Ameya Pawar, in November the CTA agreed to bring back the #11 and #31 lines as a pilot this spring. 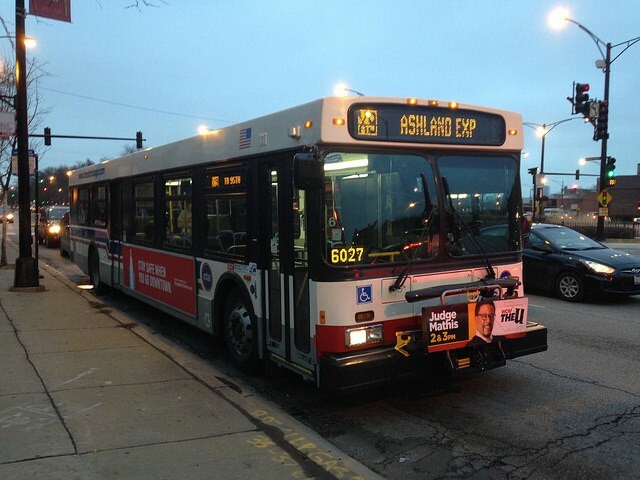 The agency also announced it would bring back express bus routes on Ashland and Western —that service resumed last week. 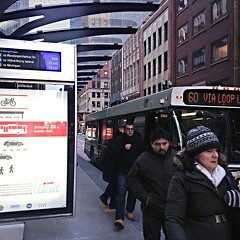 A Loop Link station on Washington Street. 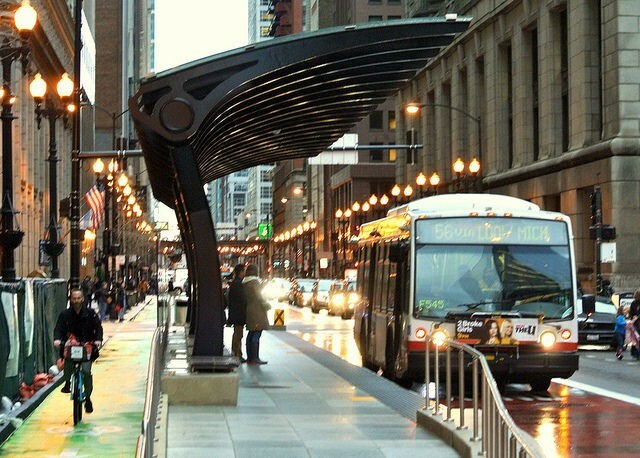 But the biggest transit story of the year was the debut of the Loop Link downtown bus rapid-transit corridor, which is still a work in progress. 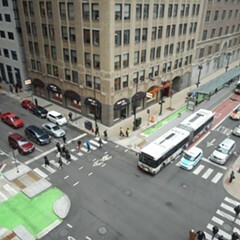 The $41 million project dramatically reconfigured Washington and Madison in the Loop, repurposing mixed-traffic lanes to make room for red bus-only lanes, raised bus-loading platforms, giant rain canopies with tons of seating and, on Washington, a protected bike lane. The route, which is used by six bus lines, also includes bus lanes on Clinton and, eventually, Canal. 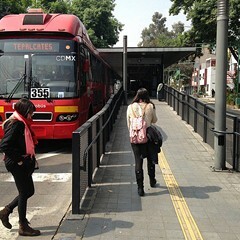 Metrobús offers a taste of how robust BRT could work on Ashland. While Chicago's express bus route had an underwhelming debut, trip times seem to be improving.